In the mid-1980s, Donna Agrell acquired a rare Grenser & Wiesner bassoon, built in Dresden sometime around 1820. The bassoon came in its original case, with an address label indicating that the instrument had been delivered to Stockholm. Further research into the Stockholm music scene during the early 19th century revealed that instruments from Grenser & Wiesner were popular in Sweden. One who swore by his bassoon from the company was Frans Preumayr, a musician of German origin who played in the orchestra of the Royal Opera, but also made a name for himself abroad as a bassoon virtuoso, garnering praise in London and on the continent. Such a gifted player naturally inspired composers to write for him, and these included the flamboyant music director at the Stockholm opera, �douard Du Puy, and a young Franz Berwald, employed among the strings of the opera orchestra. For the present recording Donna Agrell has chosen three chamber works which were all premi�red with Preumayr on the bassoon. 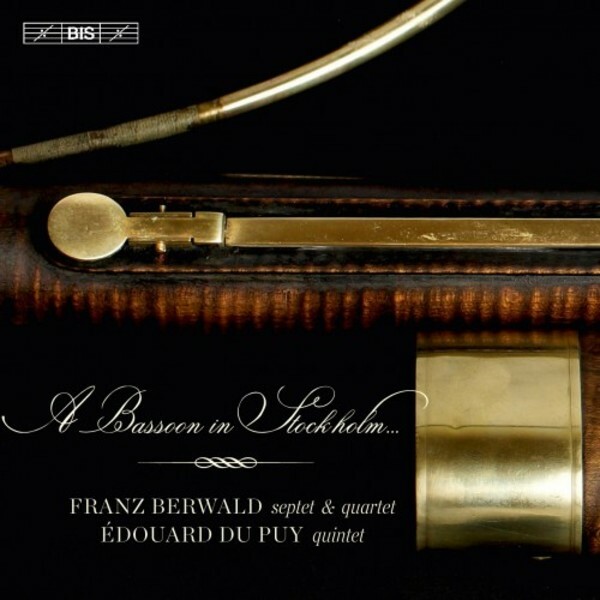 She is joined by colleagues from the Orchestra of the Eighteenth Century as well as by Ronald Brautigam � all of them playing period instruments � in Berwald's celebrated Septet in B flat major and the less well-known Quartet for piano and winds, and in Du Puy's Quintet for bassoon and strings.